"Earthwood integrates sustainable construction technology with traditional building design methods"
The main challenge of the project is to think about an architectural module that can be constructed in a limited timetable, i.e. 2-4 days; that is composed of natural and recyclable materials; that is self-sufficient through renewable energy sources and sound water management, while simultaneously improving living conditions, minimizing its ecological footprint and maximizing its positive impact on the environment. 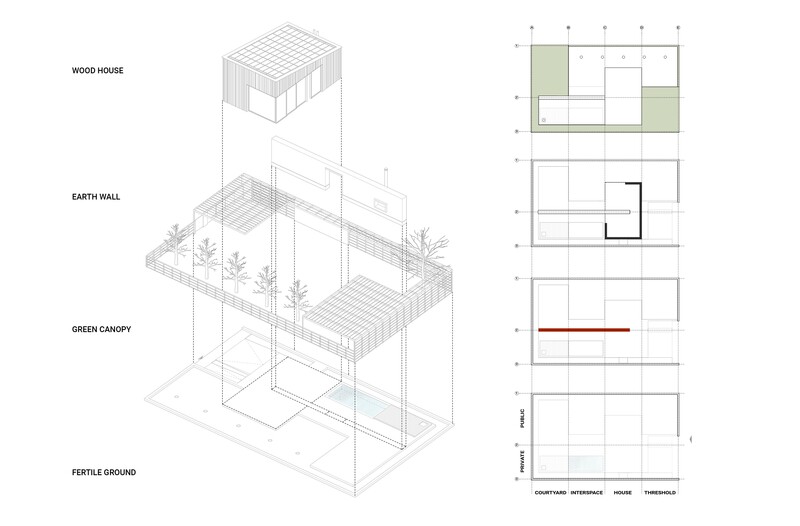 The architectural composition comprises four main principles of sustainability, i.e. the Fertile Ground, the Green Canopy, the Earth Wall and the Wood House. Earthwood integrates advanced energy and water utilization processes regarding its bioclimatic operation. The energy autonomy of the house is achieved with the installation of integrated photovoltaic panels (BIPV) on the 10 degrees pitched roof which are connected with a Powerwall battery. The stored electrical power is also used to heat water for household usage and for heat convection through water pipes integrated inside the rammed earth wall. Bearing in mind the annual rainfall data for the Attica Basin, two water reservoirs are created to collect rainwater from the specially designed surfaces and roof, and recycle it either for household use or for irrigation. 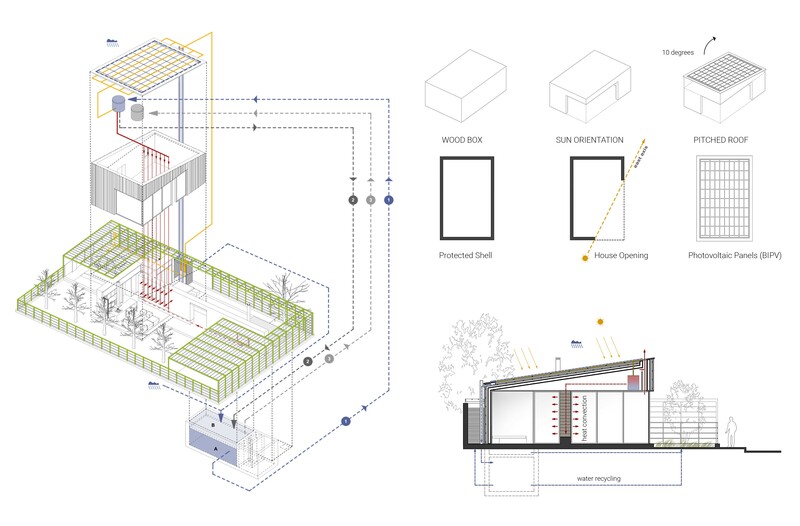 The Green Canopy enhances user interaction, while also creating shaded courtyards. 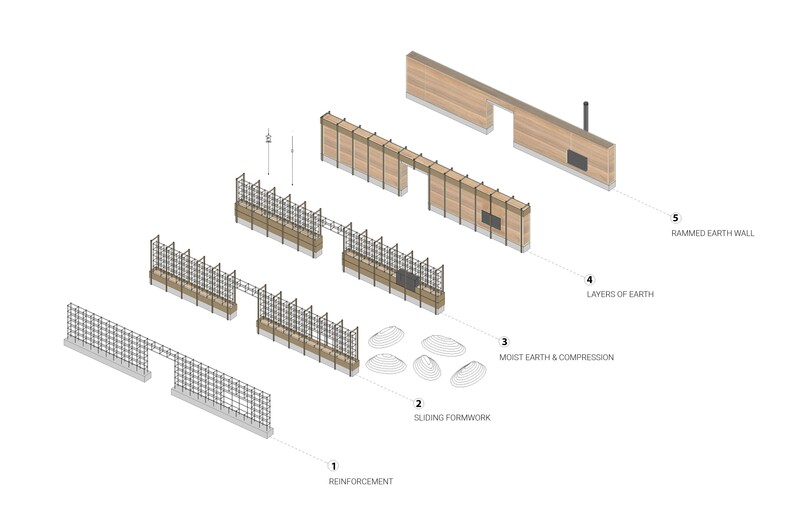 The research methodology regarding the Structural Cross Laminated Timber Panelling System is related to the construction analysis of bearing structure, with the intention of creating a unified corner opening totalling 11m in length without the use of supporting columns. The next research methodology regarding the Rammed Earth wall concerns CAD/CAE simulation and laboratory examination of the behavior of compacted layers of earth in the specific environment, or in a possible seismic reaction. 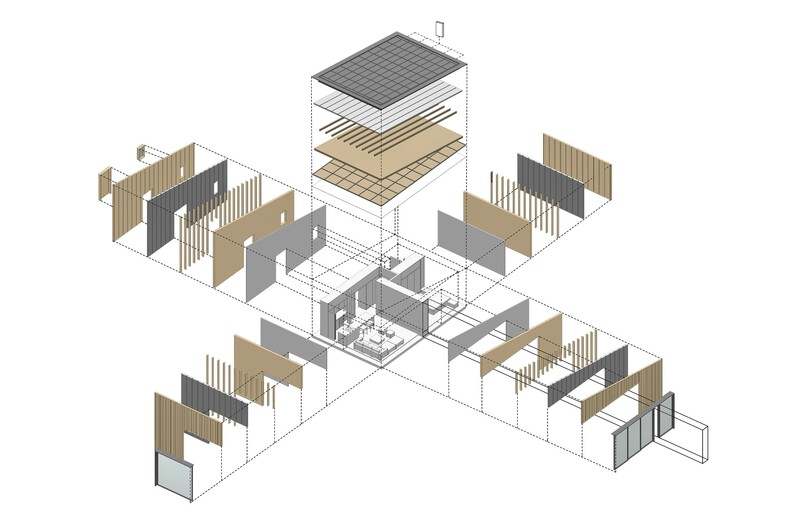 The Rammed Earth construction process takes place in situ with the use of a sliding formwork. The construction is finished when the formwork is removed leaving visible layers of compacted earth. The use of recyclable materials and renewable energy sources creates a unique architectural experience by improving living conditions, eliminating the environmental footprint as well as raising ecological awareness as a whole. Towards this direction, the house is committed to the triple bottom line concept which asserts that long-term and sustainable progress requires the balanced achievement of economic development, environmental performance and social advancement.